The Sustainable Development Goals (SDGs), adopted by 193 countries in September 2015, outlines a framework for a better global future by 2030. The SDG framework provides a roadmap for businesses to take action on some of the most pressing issues confronting our world in the pursuit of a more prosperous, inclusive and peaceful world. The Global SDG Awards was created to act as a catalyst for positive change. By turning sustainability into a competitive race to the top, we hope to increase the rate of SDG adoption, foster the inclusion of new reporting metrics based on SDG indicators and create a platform to recognize outstanding corporate efforts. Early estimates suggest that achieving the SDG targets will require annual incremental investments of between $5 to $7 trillion USD. While the scale of this challenge is immense, private sector leaders are already embracing the SDGs. According to KPMG, approximately 2,500+ companies now include the SDGs in their annual sustainability reports. Another study estimates that the SDGs represent a $12 trillion market opportunity that could create 380 million jobs. 17 unique opportunities to demonstrate your global leadership. Please click on one (or more) of the icons below to download our SDG specific application questions. For submission related inquiries, please email us using our contact us page. The awards take place once per year with applications opening in August 2018. Below are some key dates. For the latest information, be sure to sign up for our email updates. Small & Medium Sized Companies <10 Employees ($499 USD). Large Companies <100 Employees ($799 USD). Enterprises/Multinationals >100 Employees ($1,499 USD). *Information from this section will not be published & will only be available to judges. What Do Finalists & Winners Receive? The Global SDG Awards sends a powerful message to clients, vendors, prospects and employees – that your company is a global leader in advancing sustainable development through your corporate responsibility efforts. The 2018 Global SDG Awards Winners will receive digital branding assets that include the year, category and level of achievement. These graphics can be used in online communications materials or embedded in future sustainability reports, annual reports or integrated reports. 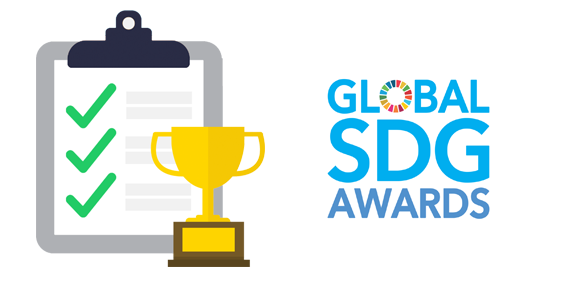 Winners of the 2018 Global SDG Awards will be announced on March 25th, 2019 via a press release and accompanying social media anouncements. A custom trophy will be provided to each of the winners, mailed to the address specified in the original application. Will The Information Included In My Application Be Made Publicly Available? Only the information included in the media package will be visible to the general public will be the elements. All details about the financial performance and expansion plans will kept confidential, visible only to our expert panel of judges. Can I Make Changes To My Submission Once I’ve Sent It? The Global SDG Awards reviews submissions as they are received to ensure that all necessary elements have been included. In situations where one (or more) of the requirements have not been fulfilled, a representative from the organization will email the primary contact provided. Once an application has been submitted – and deemed complete – we will not accept changes or revisions. Have A Conflict Of Interest With A Judge? Judges are precluded from reviewing submissions where a conflict of interest (or perceived conflict of interest) exists. Examples include: submissions by current employers, direct competitors or clients. If you have a specific concern about a potential conflict of interest, please contact us directly and we’ll take all necessary steps to resolve it proactively. Can I Cancel My Submission And Get A Refund? Unfortunately we cannot offer refunds once an application has been submitted. If you wish to completely withdraw your application from the awards please email us at [email protected].